A senior Arab League official has condemned a recent remark by US Republican presidential hopeful Newt Gingrich who said Palestinians are an “invented” people. 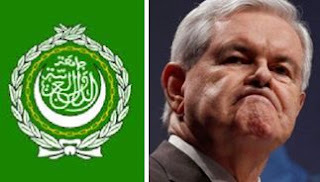 On Sunday, Mohammed Sobeih, the Arab League official handling the Palestinian affairs said, “If an Arab or Palestinian official said a racist comment that was one-millionth of what this US candidate said, the world would have been in continuous uproar,” the Associated Press reported. “If these comments were made for political gains, then this is an even bigger disaster. But it appears that this is a cheap attempt to get more votes in an election,” Sobeih said.